I have found the best, most innovative, most creative toy that I have ever seen. I cannot stop raving about SMARCKS! The inventor of SMARCKS is a mechanical engineer and comes from a family of educators. In fact, an engineer, a school district superintendent, a teacher, and a school counselor were the core design and development team members for the SMARCKS! 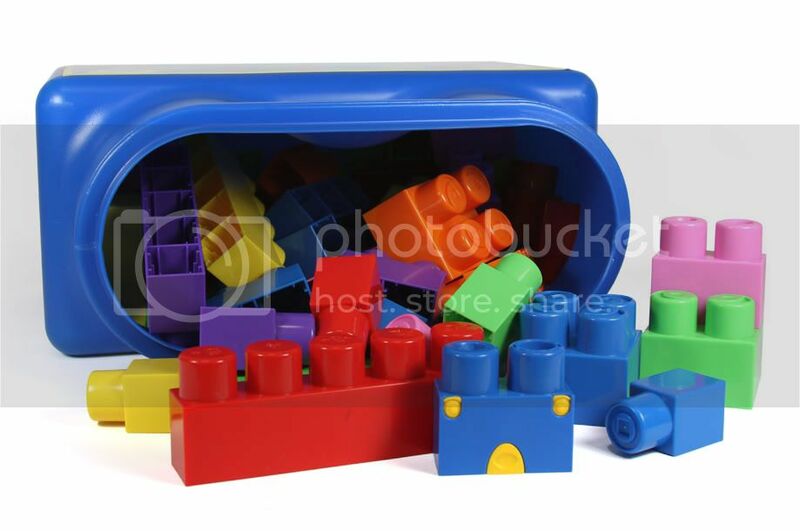 The concept of the talking building blocks came to the inventor one day while his children were playing. There were many educational toys around, but his children chose to play with their building blocks. Then came the idea to combine the educational experience of electronic toys with building blocks in a way that would hold a child's attention for hours on end. I was given the chance to try out SMARCKS, and I am so glad I did. SMARCKS are talking building blocks. Not only do they talk, they are smart too! SMARCKS know which blocks you place them on, and respond accordingly. We were given the 70 piece block starter set, which includes 28 one blocks (4 of each 7 colors), 21 two blocks (three of each color), 7 three blocks, 7 four blocks, and 7 five blocks (each number with one of each color), and one blue talking block. This set in itself is amazing! The blocks are larger, so safe for use by little ones and easier for little hands to use. With 7 colors kids can really explore their creativity and build fun and unique things. We were also given 10 other talking blocks to try out. Now, these talking blocks have a secret. They know which blocks you have put them on (the blocks are programmed not to talk twice in a row when stacked on the same block), and which blocks you should put them on next. In fact, some of the blocks actually have a puzzle type sequence that you figure out in order to hear a secret song! Lets take, for instance, the red nursery rhyme block. Place the red block on a two block and it sings the first verse to "The Itsy Bitsy Spider". Now, place it on the three block and it sings the next verse. For each number block higher it sings the next verse! The blue Monkey Math block is similar. The Monkey Math block sings the song "Five little monkeys jumping on the bed...one fell off and bumped his head", only it knows what number to say by knowing which blocks you put it on! Now let me tell you about my kids' FAVORITE talking block (that we received anyhow). Nolyn is holding the Red Music Block which is on the two green building block. The Music Blocks play an absolutely addicting song...go listen to it here (click on audio samples). Not only do the Music Blocks sing, they light up too! They are very fun, and they really grab a toddler's attention! The talking blocks require two AAA batteries (which are included to begin with), and they are very simple to replace. These blocks are very sturdy and seem like they will last a long time, definitely worth every penny spent! I really can't say enough about these blocks...to me they are a MUST HAVE for any parent, teacher, doctor's office, these blocks should be found anywhere a child might play! These blocks are incredibly affordable and competitively priced. I like Smarcks on FB and told them that you sent me. Fan of Smarcks on FB, let them know you sent me! I liked Smarcks on FB and told them you sent me! I also liked 6 in the nest on FB! I tweeted about this giveaway:)Plus, I'm following you! I follow you on GFC, like Smarks on FB (Kristen H), and left them a comment! I follow Smarcks on GFC. I Like SMARCKS on Facebook (Ellie W)and commented that you sent me. "Circle of moms" vote! Voted for Six in the Nest today! I entered the "best bottoms diaper giveaway"
Circle of Moms vote, voted or Six in the Nest today!! Voted at picket fence blogs for Six in the Nest! Circle of Moms vote, voeted for Six in the Nest today! Voted for Six in the Nest on picket fence blogs! Like Smarcks on FB and posted on their wall. Voted on Circle of Moms! Like SMARCKS on Facebook and post "Six in the Nest sent me" on the wall ~ Nancy P.
Circle of Moms vote today! I "liked" Smarcks on Facebook and said you sent me. I like Smarks on facebook and left a comment. I voted on circle of moms today! I am a fan of Smarcks via Facebook as Jill Myrick and have left a comment that you sent me. I am following Smarcks Blog via GFC as Jill Myrick. Posted on Giant Microbes fb page. I like them on FB and tagged you! I like smarcks on facebook and told them you sent me!